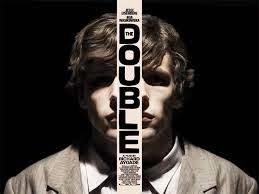 There are a lot of stories about doubles, or another side (usually an evil side) of a person coming out: The Nutty Professor, The Hulk, Dr. Jekyll and Mr. Hyde, Fight Club and of course Dostoyevsky’s novel The Double, which this film is based on. Richard Ayoade's film debut, Submarine, was one of my favorite films of 2010, and is still among my favorite films of the last 5 years. 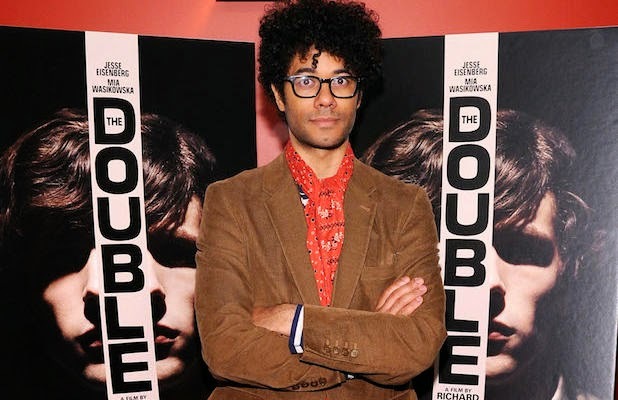 I'm also a fan of his show "The IT Crowd" (which is streaming on Netflix if you're interested) in which Ayoade played the humorous and lovable Maurice Moss. So naturally I was excited to see his latest film, even though it looked like a massive departure from his previous work. It is still technically a comedy, but a far darker comedy that he's been a part of before. For fans of his previous work it's fun trying to spot all the cameos from actors who have worked with him before. Noah Taylor, Craig Roberts, Sally Hawkins, Paddy Considine, and Yasmine Paige all from Submarine, plus Chris O'Dowd and Christopher Morris from The IT Crowd make appearances too. 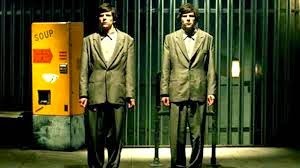 However it's Ayoade newcomers Jesse Eisenberg and Mia Wasikowska who are the main characters here (well Eisenberg the main character(s) and Wasikowska more of a supporting role). Eisenberg plays Simon James a shy, introverted young man working as a data cruncher for a government agency from who knows what year, or from what country for that matter? The machinery and other tech in this world Ayoade has created is clearly outdated and constantly breaking down. The production design is fantastic, and one of the main stars of the film. Everything is so drab it's hard to for anything or anyone to be unique in this world. In fact in an office video we are shown The Colonel, the head of the company, says there is no such thing as special people, just people. But even among non special people Simon is below average. Simon has no manner of luck at all. Everything seems to go wrong for him. His name badge/swipe card to get into work is corrupted and he has to sign in as a guest everyday because no one at work seems to recognize him despite his 7 years of service at the company. As Harris (Noah Taylor), one of his only sort of friends, states he has a forgettable face, he's unnoticeable, a bit of a "nonperson." He is clearly attracted to his coworker Hannah (Mia Wasikowska), who also doesn't seem to notice him. She lives in the building across the way from Simon, and he creeps on her from time to time. When Simon witnesses someone commit suicide by jumping off a ledge right outside her building, it gives Simon a chance to finally talk to her. They talk about the man who committed suicide and discuss the upcoming, mandatory work party. He buys a gift of jewelry for her, and is rather excited about meeting her at the party. However, once he gets there, of course, his card doesn't work and no one will let him in because they still somehow don’t recognize him. It's about all he can take. The next day a new hot shot begins working at the company and he looks exactly like Simon. His name is James Simon and he's the exact opposite of Simon James. He's confident and knows what he wants and how to get it, and more importantly he goes after it and he gets it. At first they become friends. They try to balance each other out. Simon is smarter and does the hard work and takes the aptitude tests, while James handles all the social situations that Simon is too awkward and shy to handle himself. That is, of course, until James starts wooing Hannah and stealing Simon's work to impress the bosses. In a company that doesn't believe in special people, James stands out. He very quickly becomes the most popular worker in the office and everyone continues to ignore Simon except for the boss who wishes he would be more like James. Simon’s double, much like our own doubles (if we were to have them) is everything we are not, everything we wish we were and can do everything we wish we could. This is a hallucinatory tale. His doppelganger shows up to take over his life and live it better than he was. He has to figure out how to retake his life and finally start living how he wished he could, but without the look-a-like. I have already spoiled a good deal, but at the risk of spoiling even more I'll say you shouldn't see everything literally. It may be fairly obvious to say, but this story has more in common with Fight Club than Jekyll and Hyde. Even though this film is labeled as a comedy, the humor is mostly subtle, dry humor. It's at times creepy, but even that is mostly played up for humor. It's a solid film, but left me wishing there was just a bit more to it in the end. It's an enjoyable film, we written, well acted, good cinematography and it even gets fairly intense. It's in a limited run in theaters, but if you're interested and it isn't out near you, you can always digitally rent it from Google Play, iTunes, Vudu, and Redbox Instant.